Doris Fornshell, age 83, of Carrington, passed away Thursday, November 15, 2018 at Golden Acres Manor. Doris Elaine Anderson was born to Oscar & Alyce (Larson) Anderson, October 31, 1935, at Sheyenne, ND. She was raised at Bremen, ND, and attended grade school there. She started high school in New Rockford till her mom passed away May 23, 1952. At the age of 16, Doris quit school and stayed home to raise her brother and sister. She finished state high school in 1958. Then she worked at the Fireside where she met Leo Fornshell. They were married at the Augustana Church west of Sheyenne, October 14, 1962. They lived on a beef livestock-grain farm east of Carrington till 2007 when they moved into Carrington. 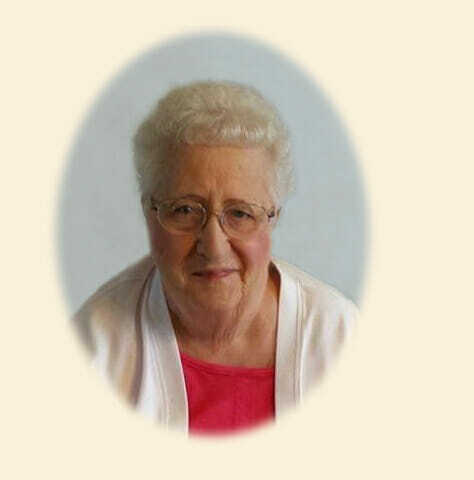 She had been a 4-H leader for Rose Haven Variety 4-H Club, a member of Everglad Homemakers Club for many years and also a member of the Federated Church. She was a member of the Tops Chapter for many years. Doris also sold Avon for 40 years until she died. Doris’s hobbies were currently doing puzzle books, Reading, & Facebook to see what was new/find recipes on her Kindle, and waiting for Wheel of Fortune. In her earlier years, she had a passion for canning, gardening, flowers, cake decorating, the art of bread making, sewing and fancy work. She would make many phone calls throughout the day to her friends & nightly to her kids. She truly was a social butterfly and LOVED to have company over to her house for ANY occasion through her years. They have two children, Pam (Jim) Diede, Pingree, and Terry of Alexander, ND; three grandchildren, Jada (Matt) Specht, Eaton, CO, Zach (Amber) Koenig, Beloit, KS, and Shayla Diede, of Pingree and two great-grandchildren Hannah and Hunter Koenig. She leaves behind a brother, Donald Anderson of New Rockford; a sister, Ada (Frank) DeBolt, Jamestown; two sisters-in-law, Dorothy Fornshell and Mary Fornshell; a brother-in-law Tom (Kate) Fornshell, several cousins, nieces & nephews. She was preceded in death by her husband, Leo; her parents; father & mother-in-law, Lee & Edna Fornshell; sister-in-law, Betty Wood and 2 brothers-in-law, Jim Fornshell and Frank DeBolt. Visitation Friday, November 23, Noon-7:00PM followed by a Prayer Service at 7:00PM all at Evans Funeral Home, Carrington. Funeral Service Saturday, November 24, 2018, at 11:00AM at Federated Church UCC/UMC, Carrington. Burial will be at the Carrington Cemetery. Sending thoughts and prayers to the Fornshell family, she always welcomed me into her home, and was such a wonderful lady. Our thoughts & Prayers are with you she was a very nice person. Pam, Terry and family. So sorry to hear of the passing of Doris. We had so many good times at Tops and the conventions, etc. and just visiting. She will be missed. May God wrap his loving arms around you all and give you peace and comfort. Thoughts and prayers to the Fornshell family. Doris accompanied me to many Avon meetings and banquets over the years when I lived in New Rockford and we always had great visits. She was a good friend and will be missed.